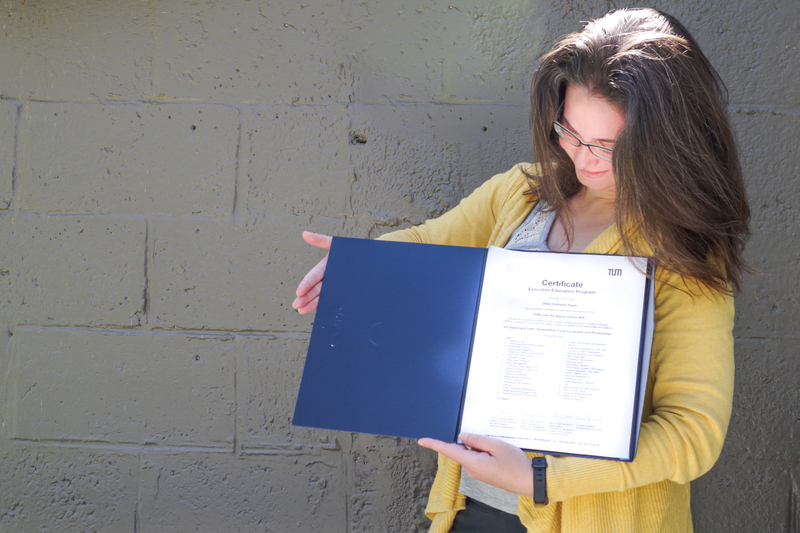 Jillian Regan, consultant at Rillian holding her Lean Six Sigma Yellow Belt certification from the Technical University of Munich (TUM). Photo © Jillian Regan 2018. I recently got my Lean Six Sigma Yellow Belt certification from the Technical University of Munich (TUM) through an online course offered by TUM on the edX platform. I admire how the certificate itself and the process of obtaining it was highly efficient, exemplifying the ideas of Lean and Six Sigma, reducing waste and reducing variation in quality improvement. Lean and Six Sigma are two separate, but related philosophies in the quality improvement and management realm across a variety of different industries. I was first introduced to the concept in the healthcare industry and in the field of public health. Wanting to further my knowledge and be able to better apply the data and fact driven quality improvement Lean and Six Sigma tools to improve my performance and range of services offered as a consultant, I decided to get certified in Lean and Six Sigma. I found that an online series of three courses offered by TUM through the edX platform was the most efficient and cost effective way to gain this certification. Online courses allowed me to work my continuing education around my work schedule. Also the cost was low enough to not waste or strain the resources of a fresh, innovative, new consulting agency for providing professional growth and development for its consultants. I also thought it would be interesting to take online courses from a German university, TUM, with professors from backgrounds in industries, such as manufacturing, that I am not experienced in as I learned of Lean and Six Sigma from a public health and healthcare background, thus providing a different perspective. Today Lean and Six Sigma are often combined, and I wanted to be able to provide the combined effect that has been shown to reduce costs, improve customer, client or other stakeholder satisfaction with quality control and continuous quality improvement in processes, services, or products in the projects I work on. Though they are often combined, Lean and Six Sigma are two separate, but related philosophies. It can be useful to differentiate between the two. Lean focuses on reducing waste while Six Sigma focus on reducing variation, such as variation in a process, product, or service that is out of specification. Variations are often considered to be errors or mistakes, depending on how far out of specification the variation is and how the variation affects the process, service, or product. My Lean Six Sigma Yellow Belt certification from TUM efficiently lists out and differentiates which topics covered in the series of certification courses I took fall under each umbrella: Lean or Six Sigma. Most professional continuing education certificates do not include such detail, which causes wastes in time or an increased risk of error in understanding what topics were included in the course(s) that the certification was obtained through. The listing out of the topics on my Yellow Belt certificate allows me to easily, efficiently, and with a reduced chance of errors in listing the topic under the wrong umbrella, list them out in the table below if you are curious to learn which umbrella each topic falls under. It has taken a longer than expected amount of time to post about getting Lean Six Sigma certified consultant becoming certified at the Yellow Belt level because I have been busy getting Jill + Ian’s bicycle rental service started — a service that Rillian provided research and development for and is now being added as a service provided by of our affiliated businesses, Jill + Ian–and applying Lean Six Sigma principles to the service from the start to improve access to bicycles through a quality focused and innovative bicycle rental service. However, due to the application of Lean and Six Sigma principles in my photography business, Jillian Regan Photography, LLC, I was able to quickly and efficiently add photos to complement this blog post. 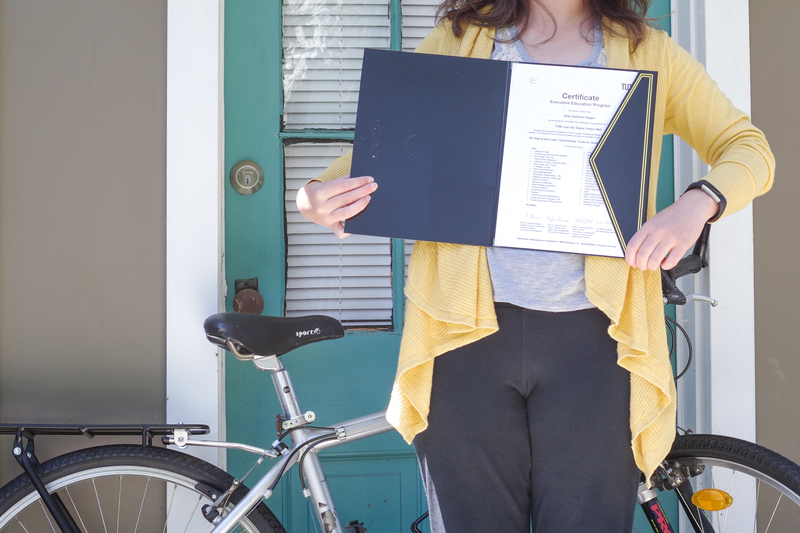 Jillian Regan, consultant at Rillian, has been very busy getting Jill + Ian’s bicycle rental service started–a service that Rillian provided research and development services for–and only just now had time to pose for a photo with her Lean Six Sigma Yellow Belt Certificate and her bicycle. Her bicycle is available for rent through Jill + Ian’s Bicycle Rentals. Photo © Jillian Regan 2018. Getting my Lean Six Sigma Yellow belt certification from TUM through the edX platform was an efficient way to improve my performance as a consultant and be able to better offer data driven quality improvement technical assistance and support and consulting to other organizations. The certificate itself is created to reduce waste and variation by efficiently listing out the topics covered under Six Sigma and Lean and details not normally included on a professional continuing education certificate itself for easy and efficient access and comprehension.